This section is dedicated to the Haslingden layout. 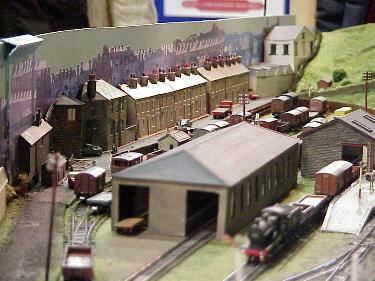 Haslingden layout is an N gauge layout that is owned by the Haslingden Model Railway Group. I know Keith Savory who is a member of the Bury Standard 4 Wagons Group on the East Lancashire Railway. Haslingden has appeared at various shows over the years. The other members are Dave Belshaw, Donald Braithwaite, Stewart Howarth and David Cothliff-Goth. The model, which measures 3.2 metres by 0.6 metres, includes some buildings still in place today, although the line has now become the Haslingden bypass.